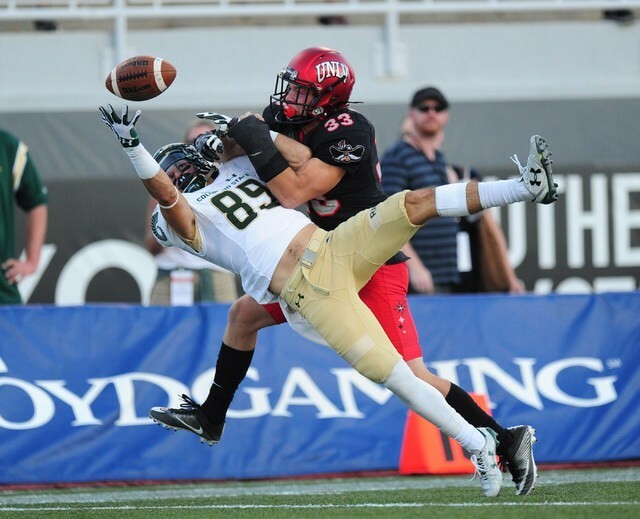 Dalton Baker is a hard hitting safety from UNLV who recently took the time out of his busy schedule to sit down with NFL Draft Diamonds owner Damond Talbot. • I am from Las Vegas, Nevada, born and raised. I love Las Vegas because it is unlike any other city in the world. There is always something to do and it is always warm. • Film Study, Practice, Strength and conditioning. Film study comes first because you need to have an idea of what to expect for the upcoming weeks and it really helps to give you an advantage come game time. Practice is important as well because it gives you a chance to visualize what you have seen on film and get reps at what you have seen on film. Strength and conditioning is important as well, the season is long and hard on you body and it is important to keep your body as strong as you can throughout the season, I would also include preventative treatment as a part of strength and conditioning. All 3 are very important in their own right because without one, the other two are lacking in effectiveness. • I worry about not accomplishing my personal goals I have mapped out for myself, I have higher expectations for myself than anybody else could ever place on me and understand my goals will get me to where I want to be. • Coming out of high school I failed at getting a Division 1 football scholarship. It was an extremely tough period for me, seeing all my friends sign their LOI. I knew I could play at the next level and decided it was on me to show that, and the only way for me to do that was walk on and go take it. Which ultimately I did. • My work ethic and ability to lead by example. My teammates knew what they were getting out of me day in and day out because it never changed. I was always going to give my best effort at anything whether it was watching film, running sprints, lifting weights, stretching, communicating, it didn’t matter because that’s just the type of person I am. The way I see it is if I am going to be doing something I might as well do it to the best of my ability. • Parris Campbell from Ohio State, that dude can fly. • I would be an orthopedic surgeon. • My room, I feel like your room is a direct reflection on how your life is. • My family member, because family is the closest thing you’ll ever have. • Naruto, because he never gives up and had to work to realize his dream. • It would have to be not getting a scholarship and walking on. I understood I had what it took to play D1 and came to work everyday with a chip on my shoulder, to show that I did belong. • Probably having to do the freshman talent show at fall camp my freshman year, I did an bad talent show and sang the fight song and everyone gets boo’d no matter what. • When we were playing Ohio State and I tackled the running back and broke my facemask. • I would say film study along with a relentless mindset to always do more. • Jesus, so I could get his perspective on how I am living my life. • The estate maybe, I would never open a dance club so that’s tough. • Respected, because respect is something you have to earn, I don’t really care if anybody likes me but I will earn their respect. • I have a hard time with this question because I cant imagine guys having a team give them everything they say they have ever wanted and blowing it. I understand life happens at a different pace for everyone and everyone handles things differently but not at the cost of your dream.